Starters by Lissa Price is her debut novel that is set in a post-apocalyptic future of the United States. Everyone between the ages of 20 and 60 had died in the Spore Wars three years prior to the events in this science fiction novel. It is the first in a projected two-part young adult series. Callie Woodland is an unclaimed "Starter" who is responsible for her seven year old brother, Tyler. Their parents are dead, and they have no other family to claim them. As a result, they are forced to squat in abandoned buildings and live on the run, along with former neighborhood friend, Michael. In order to support her brother, she decides to rent her body out to "Enders" via secret company, Prime Destinations, since any other work is illegal for individuals under the age of 19. Callie sees this as a great deal, until something goes wrong in the process. I found Starters to be a very imaginative and well-written example of the sci-fi genre. As a young adult book, it is one of the best I have encountered. The dystopian US was both realistic and frightening - frightening mostly because it was so realistic. The premise was very plausible, and the explanations used in the world-building were very strong. As with other YA dystopians, I did not find myself asking, "How could this happen?" The characters in Starters were the meat and bones of the novel and played their parts well in the progression of the story. Callie was a sympathetic character, and I was rooting for her to be successful from the first sentence. The secondary characters win the prize for the book because they were all such beautiful shades of gray. I was guessing who the "bad guys" were and never had it correctly figured out. The one problem that I had with Starters was the pacing. While most of the story flowed along nicely, there were several parts that felt a bit rushed. Some scenes had things fall into place too easily, and I would have liked to know more of the motives driving a few of the characters. Overall, however, the novel was a fantastic debut. The story sucked me in and held me until the very end. It is a brilliant addition to the young adult subset of the science fiction genre (or vice versa). 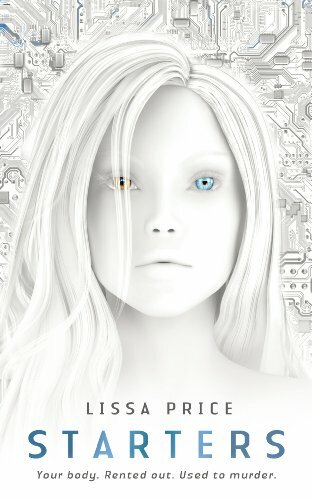 I cannot wait for Enders and future projects from Lissa Price. To satisfy FTC guidelines, I am disclosing that I received this book for free from the publisher in exchange for an honest review. It has in no way affected the outcome. Ooh! This sounds like such a cool book. It kinda reminded me of Whedon's Doll House. I've been ummm-ing and ahhhh-ing over this one for a while - there are so many good dystopians out there at the moment that I've had to limit myself for fear of overload. I had heard there were pacing issues, but it's interesting to see its overly fast pacing, not overly slow.